Asset Manager provides a flexible and robust platform for asset management and wire-free sensor monitoring. 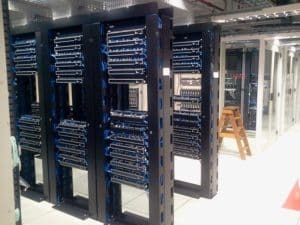 This enterprise-wide solution is adaptable to varied environments such as data centres, IT closets, buildings, and branch offices as well as various industrial applications. Asset Manager is designed to complement RF Code’s active RFID hardware for asset tracking and environmental monitoring. The result is a robust solution for asset management or environmental monitoring or a combination of both. The flexibility of Asset Manager enables it to be deployed in a wide variety of uses from data centres and data closets to buildings and branch offices as well as industrial solutions like manufacturing. Asset Manager’s adaptability and ease of use enables a fast return on investment while complementing other business systems. A complete, end-to-end solution for real-time asset tracking and environmental monitoring, Asset Manager enhances your ability to manage assets and monitor the conditions around them throughout their life cycle, from deployment to retirement. Current and historical asset attributes — financial data, physical location and contractual information, for example – reside in an SQL database, enabling complete asset life cycle management. Asset data is easily gathered and viewed in table and map views, simplifying asset management tasks across departments, buildings, or entire organisations. And all data reported by RF Code wire-free sensor tags is stored as well, making it easy to utilise your environmental data to create detailed trending reports and graphs. Asset Manager’s Mobile Apps enable access to both asset information and sensor information from a variety of mobile computing devices. Important information and alerts are always available from most Apple and Android devices. Asset Manager, provides full lifecycle asset management that is flexible, automated, and real-time. It is ideal for most any type of asset in almost any type of industry. Combining real-time asset tracking and visibility with sophisticated asset management software capabilities, Asset Manager is flexible enough to manage all types of assets, from IT assets to logistics containers. Asset Manager’s real-time monitoring and alerting about the environmental conditions surrounding critical assets and spaces provide proactive approaches to dealing with physical threats in centralised locations and distributed environments. To find out about how we can implement RF Code monitoring solutions contact us.